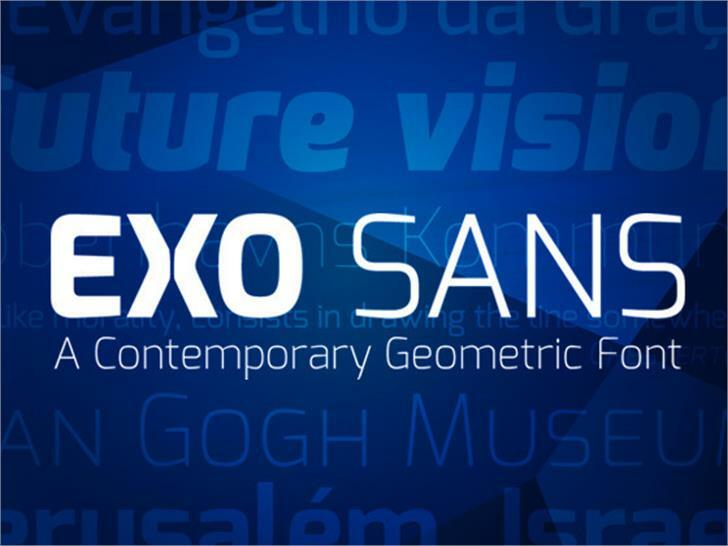 Exo its geometric sans serif font family. 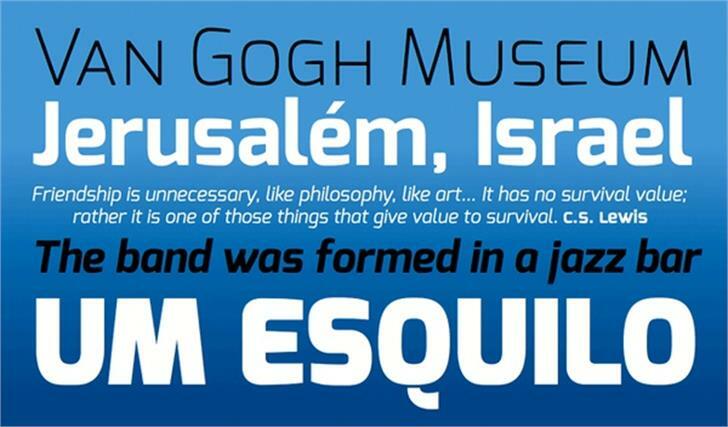 Its design started almost two years ago as way to discover typography in a more advanced way. 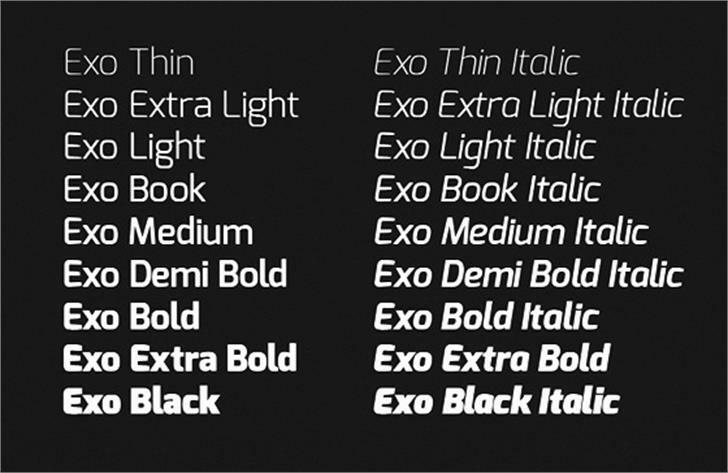 "Exo is a very complete font family"
And a free (like: f-r-e-e) one! Copyright (c) 2011 Natanael Gama (exo@ndiscovered.com), with Reserved Font Name "Exo"
Copyright (c) 2011, Natanael Gama (http://www.ndiscovered.com | exo(at)ndiscovered.com>),<br>with Reserved Font Name Exo.<br><br>This Font Software is licensed under the SIL Open Font License, Version 1.1.<br>This license is copied below, and is also available with a FAQ at:<br>http://scripts.sil.org/OFL<br><br><br>-----------------------------------------------------------<br>SIL OPEN FONT LICENSE Version 1.1 - 26 February 2007<br>-----------------------------------------------------------<br><br>PREAMBLE<br>The goals of the Open Font License (OFL) are to stimulate worldwide<br>development of collaborative font projects, to support the font creation<br>efforts of academic and linguistic communities, and to provide a free and<br>open framework in which fonts may be shared and improved in partnership<br>with others.<br><br>The OFL allows the licensed fonts to be used, studied, modified and<br>redistributed freely as long as they are not sold by themselves. The<br>fonts, including any derivative works, can be bundled, embedded, <br>redistributed and/or sold with any software provided that any reserved<br>names are not used by derivative works. The fonts and derivatives,<br>however, cannot be released under any other type of license. The<br>requirement for fonts to remain under this license does not apply<br>to any document created using the fonts or their derivatives.<br><br>DEFINITIONS<br>"Font Software" refers to the set of files released by the Copyright<br>Holder(s) under this license and clearly marked as such. This may<br>include source files, build scripts and documentation.<br><br>"Reserved Font Name" refers to any names specified as such after the<br>copyright statement(s).<br><br>"Original Version" refers to the collection of Font Software components as<br>distributed by the Copyright Holder(s).<br><br>"Modified Version" refers to any derivative made by adding to, deleting,<br>or substituting -- in part or in whole -- any of the components of the<br>Original Version, by changing formats or by porting the Font Software to a<br>new environment.<br><br>"Author" refers to any designer, engineer, programmer, technical<br>writer or other person who contributed to the Font Software.<br><br>PERMISSION & CONDITIONS<br>Permission is hereby granted, free of charge, to any person obtaining<br>a copy of the Font Software, to use, study, copy, merge, embed, modify,<br>redistribute, and sell modified and unmodified copies of the Font<br>Software, subject to the following conditions:<br><br>1) Neither the Font Software nor any of its individual components,<br>in Original or Modified Versions, may be sold by itself.<br><br>2) Original or Modified Versions of the Font Software may be bundled,<br>redistributed and/or sold with any software, provided that each copy<br>contains the above copyright notice and this license. These can be<br>included either as stand-alone text files, human-readable headers or<br>in the appropriate machine-readable metadata fields within text or<br>binary files as long as those fields can be easily viewed by the user.<br><br>3) No Modified Version of the Font Software may use the Reserved Font<br>Name(s) unless explicit written permission is granted by the corresponding<br>Copyright Holder. This restriction only applies to the primary font name as<br>presented to the users.<br><br>4) The name(s) of the Copyright Holder(s) or the Author(s) of the Font<br>Software shall not be used to promote, endorse or advertise any<br>Modified Version, except to acknowledge the contribution(s) of the<br>Copyright Holder(s) and the Author(s) or with their explicit written<br>permission.<br><br>5) The Font Software, modified or unmodified, in part or in whole,<br>must be distributed entirely under this license, and must not be<br>distributed under any other license. The requirement for fonts to<br>remain under this license does not apply to any document created<br>using the Font Software.<br><br>TERMINATION<br>This license becomes null and void if any of the above conditions are<br>not met.<br><br>DISCLAIMER<br>THE FONT SOFTWARE IS PROVIDED "AS IS", WITHOUT WARRANTY OF ANY KIND,<br>EXPRESS OR IMPLIED, INCLUDING BUT NOT LIMITED TO ANY WARRANTIES OF<br>MERCHANTABILITY, FITNESS FOR A PARTICULAR PURPOSE AND NONINFRINGEMENT<br>OF COPYRIGHT, PATENT, TRADEMARK, OR OTHER RIGHT. IN NO EVENT SHALL THE<br>COPYRIGHT HOLDER BE LIABLE FOR ANY CLAIM, DAMAGES OR OTHER LIABILITY,<br>INCLUDING ANY GENERAL, SPECIAL, INDIRECT, INCIDENTAL, OR CONSEQUENTIAL<br>DAMAGES, WHETHER IN AN ACTION OF CONTRACT, TORT OR OTHERWISE, ARISING<br>FROM, OUT OF THE USE OR INABILITY TO USE THE FONT SOFTWARE OR FROM<br>OTHER DEALINGS IN THE FONT SOFTWARE. Copyright (c) 2011, Natanael Gama (http://www.ndiscovered.com |exo(at)ndiscovered.com>),<br>with Reserved Font Name Exo.<br><br>This Font Software is licensed under the SIL Open Font License, Version 1.1.<br>This license is copied below, and is also available with a FAQ at:<br>http://scripts.sil.org/OFL<br><br><br>-----------------------------------------------------------<br>SIL OPEN FONT LICENSE Version 1.1 - 26 February 2007<br>-----------------------------------------------------------<br><br>PREAMBLE<br>The goals of the Open Font License (OFL) are to stimulate worldwide<br>development of collaborative font projects, to support the font creation<br>efforts of academic and linguistic communities, and to provide a free and<br>open framework in which fonts may be shared and improved in partnership<br>with others.<br><br>The OFL allows the licensed fonts to be used, studied, modified and<br>redistributed freely as long as they are not sold by themselves. The<br>fonts, including any derivative works, can be bundled, embedded, <br>redistributed and/or sold with any software provided that any reserved<br>names are not used by derivative works. The fonts and derivatives,<br>however, cannot be released under any other type of license. The<br>requirement for fonts to remain under this license does not apply<br>to any document created using the fonts or their derivatives.<br><br>DEFINITIONS<br>"Font Software" refers to the set of files released by the Copyright<br>Holder(s) under this license and clearly marked as such. This may<br>include source files, build scripts and documentation.<br><br>"Reserved Font Name" refers to any names specified as such after the<br>copyright statement(s).<br><br>"Original Version" refers to the collection of Font Software components as<br>distributed by the Copyright Holder(s).<br><br>"Modified Version" refers to any derivative made by adding to, deleting,<br>or substituting -- in part or in whole -- any of the components of the<br>Original Version, by changing formats or by porting the Font Software to a<br>new environment.<br><br>"Author" refers to any designer, engineer, programmer, technical<br>writer or other person who contributed to the Font Software.<br><br>PERMISSION & CONDITIONS<br>Permission is hereby granted, free of charge, to any person obtaining<br>a copy of the Font Software, to use, study, copy, merge, embed, modify,<br>redistribute, and sell modified and unmodified copies of the Font<br>Software, subject to the following conditions:<br><br>1) Neither the Font Software nor any of its individual components,<br>in Original or Modified Versions, may be sold by itself.<br><br>2) Original or Modified Versions of the Font Software may be bundled,<br>redistributed and/or sold with any software, provided that each copy<br>contains the above copyright notice and this license. These can be<br>included either as stand-alone text files, human-readable headers or<br>in the appropriate machine-readable metadata fields within text or<br>binary files as long as those fields can be easily viewed by the user.<br><br>3) No Modified Version of the Font Software may use the Reserved Font<br>Name(s) unless explicit written permission is granted by the corresponding<br>Copyright Holder. This restriction only applies to the primary font name as<br>presented to the users.<br><br>4) The name(s) of the Copyright Holder(s) or the Author(s) of the Font<br>Software shall not be used to promote, endorse or advertise any<br>Modified Version, except to acknowledge the contribution(s) of the<br>Copyright Holder(s) and the Author(s) or with their explicit written<br>permission.<br><br>5) The Font Software, modified or unmodified, in part or in whole,<br>must be distributed entirely under this license, and must not be<br>distributed under any other license. The requirement for fonts to<br>remain under this license does not apply to any document created<br>using the Font Software.<br><br>TERMINATION<br>This license becomes null and void if any of the above conditions are<br>not met.<br><br>DISCLAIMER<br>THE FONT SOFTWARE IS PROVIDED "AS IS", WITHOUT WARRANTY OF ANY KIND,<br>EXPRESS OR IMPLIED, INCLUDING BUT NOT LIMITED TO ANY WARRANTIES OF<br>MERCHANTABILITY, FITNESS FOR A PARTICULAR PURPOSE AND NONINFRINGEMENT<br>OF COPYRIGHT, PATENT, TRADEMARK, OR OTHER RIGHT. IN NO EVENT SHALL THE<br>COPYRIGHT HOLDER BE LIABLE FOR ANY CLAIM, DAMAGES OR OTHER LIABILITY,<br>INCLUDING ANY GENERAL, SPECIAL, INDIRECT, INCIDENTAL, OR CONSEQUENTIAL<br>DAMAGES, WHETHER IN AN ACTION OF CONTRACT, TORT OR OTHERWISE, ARISING<br>FROM, OUT OF THE USE OR INABILITY TO USE THE FONT SOFTWARE OR FROM<br>OTHER DEALINGS IN THE FONT SOFTWARE. Copyright (c) 2011, Natanael Gama (http://ndiscovered.com | exo(at)ndiscovered.com>),<br>with Reserved Font Name Exo.<br><br>This Font Software is licensed under the SIL Open Font License, Version 1.1.<br>This license is copied below, and is also available with a FAQ at:<br>http://scripts.sil.org/OFL<br><br><br>-----------------------------------------------------------<br>SIL OPEN FONT LICENSE Version 1.1 - 26 February 2007<br>-----------------------------------------------------------<br><br>PREAMBLE<br>The goals of the Open Font License (OFL) are to stimulate worldwide<br>development of collaborative font projects, to support the font creation<br>efforts of academic and linguistic communities, and to provide a free and<br>open framework in which fonts may be shared and improved in partnership<br>with others.<br><br>The OFL allows the licensed fonts to be used, studied, modified and<br>redistributed freely as long as they are not sold by themselves. The<br>fonts, including any derivative works, can be bundled, embedded, <br>redistributed and/or sold with any software provided that any reserved<br>names are not used by derivative works. The fonts and derivatives,<br>however, cannot be released under any other type of license. The<br>requirement for fonts to remain under this license does not apply<br>to any document created using the fonts or their derivatives.<br><br>DEFINITIONS<br>"Font Software" refers to the set of files released by the Copyright<br>Holder(s) under this license and clearly marked as such. This may<br>include source files, build scripts and documentation.<br><br>"Reserved Font Name" refers to any names specified as such after the<br>copyright statement(s).<br><br>"Original Version" refers to the collection of Font Software components as<br>distributed by the Copyright Holder(s).<br><br>"Modified Version" refers to any derivative made by adding to, deleting,<br>or substituting -- in part or in whole -- any of the components of the<br>Original Version, by changing formats or by porting the Font Software to a<br>new environment.<br><br>"Author" refers to any designer, engineer, programmer, technical<br>writer or other person who contributed to the Font Software.<br><br>PERMISSION & CONDITIONS<br>Permission is hereby granted, free of charge, to any person obtaining<br>a copy of the Font Software, to use, study, copy, merge, embed, modify,<br>redistribute, and sell modified and unmodified copies of the Font<br>Software, subject to the following conditions:<br><br>1) Neither the Font Software nor any of its individual components,<br>in Original or Modified Versions, may be sold by itself.<br><br>2) Original or Modified Versions of the Font Software may be bundled,<br>redistributed and/or sold with any software, provided that each copy<br>contains the above copyright notice and this license. These can be<br>included either as stand-alone text files, human-readable headers or<br>in the appropriate machine-readable metadata fields within text or<br>binary files as long as those fields can be easily viewed by the user.<br><br>3) No Modified Version of the Font Software may use the Reserved Font<br>Name(s) unless explicit written permission is granted by the corresponding<br>Copyright Holder. This restriction only applies to the primary font name as<br>presented to the users.<br><br>4) The name(s) of the Copyright Holder(s) or the Author(s) of the Font<br>Software shall not be used to promote, endorse or advertise any<br>Modified Version, except to acknowledge the contribution(s) of the<br>Copyright Holder(s) and the Author(s) or with their explicit written<br>permission.<br><br>5) The Font Software, modified or unmodified, in part or in whole,<br>must be distributed entirely under this license, and must not be<br>distributed under any other license. The requirement for fonts to<br>remain under this license does not apply to any document created<br>using the Font Software.<br><br>TERMINATION<br>This license becomes null and void if any of the above conditions are<br>not met.<br><br>DISCLAIMER<br>THE FONT SOFTWARE IS PROVIDED "AS IS", WITHOUT WARRANTY OF ANY KIND,<br>EXPRESS OR IMPLIED, INCLUDING BUT NOT LIMITED TO ANY WARRANTIES OF<br>MERCHANTABILITY, FITNESS FOR A PARTICULAR PURPOSE AND NONINFRINGEMENT<br>OF COPYRIGHT, PATENT, TRADEMARK, OR OTHER RIGHT. IN NO EVENT SHALL THE<br>COPYRIGHT HOLDER BE LIABLE FOR ANY CLAIM, DAMAGES OR OTHER LIABILITY,<br>INCLUDING ANY GENERAL, SPECIAL, INDIRECT, INCIDENTAL, OR CONSEQUENTIAL<br>DAMAGES, WHETHER IN AN ACTION OF CONTRACT, TORT OR OTHERWISE, ARISING<br>FROM, OUT OF THE USE OR INABILITY TO USE THE FONT SOFTWARE OR FROM<br>OTHER DEALINGS IN THE FONT SOFTWARE. Copyright (c) 2011, Natanael Gama (www.ndiscovered.com | exo(at)ndiscovered.com),<br>with Reserved Font Name Exo.<br><br>This Font Software is licensed under the SIL Open Font License, Version 1.1.<br>This license is copied below, and is also available with a FAQ at:<br>http://scripts.sil.org/OFL<br><br><br>-----------------------------------------------------------<br>SIL OPEN FONT LICENSE Version 1.1 - 26 February 2007<br>-----------------------------------------------------------<br><br>PREAMBLE<br>The goals of the Open Font License (OFL) are to stimulate worldwide<br>development of collaborative font projects, to support the font creation<br>efforts of academic and linguistic communities, and to provide a free and<br>open framework in which fonts may be shared and improved in partnership<br>with others.<br><br>The OFL allows the licensed fonts to be used, studied, modified and<br>redistributed freely as long as they are not sold by themselves. The<br>fonts, including any derivative works, can be bundled, embedded, <br>redistributed and/or sold with any software provided that any reserved<br>names are not used by derivative works. The fonts and derivatives,<br>however, cannot be released under any other type of license. The<br>requirement for fonts to remain under this license does not apply<br>to any document created using the fonts or their derivatives.<br><br>DEFINITIONS<br>"Font Software" refers to the set of files released by the Copyright<br>Holder(s) under this license and clearly marked as such. This may<br>include source files, build scripts and documentation.<br><br>"Reserved Font Name" refers to any names specified as such after the<br>copyright statement(s).<br><br>"Original Version" refers to the collection of Font Software components as<br>distributed by the Copyright Holder(s).<br><br>"Modified Version" refers to any derivative made by adding to, deleting,<br>or substituting -- in part or in whole -- any of the components of the<br>Original Version, by changing formats or by porting the Font Software to a<br>new environment.<br><br>"Author" refers to any designer, engineer, programmer, technical<br>writer or other person who contributed to the Font Software.<br><br>PERMISSION & CONDITIONS<br>Permission is hereby granted, free of charge, to any person obtaining<br>a copy of the Font Software, to use, study, copy, merge, embed, modify,<br>redistribute, and sell modified and unmodified copies of the Font<br>Software, subject to the following conditions:<br><br>1) Neither the Font Software nor any of its individual components,<br>in Original or Modified Versions, may be sold by itself.<br><br>2) Original or Modified Versions of the Font Software may be bundled,<br>redistributed and/or sold with any software, provided that each copy<br>contains the above copyright notice and this license. These can be<br>included either as stand-alone text files, human-readable headers or<br>in the appropriate machine-readable metadata fields within text or<br>binary files as long as those fields can be easily viewed by the user.<br><br>3) No Modified Version of the Font Software may use the Reserved Font<br>Name(s) unless explicit written permission is granted by the corresponding<br>Copyright Holder. This restriction only applies to the primary font name as<br>presented to the users.<br><br>4) The name(s) of the Copyright Holder(s) or the Author(s) of the Font<br>Software shall not be used to promote, endorse or advertise any<br>Modified Version, except to acknowledge the contribution(s) of the<br>Copyright Holder(s) and the Author(s) or with their explicit written<br>permission.<br><br>5) The Font Software, modified or unmodified, in part or in whole,<br>must be distributed entirely under this license, and must not be<br>distributed under any other license. The requirement for fonts to<br>remain under this license does not apply to any document created<br>using the Font Software.<br><br>TERMINATION<br>This license becomes null and void if any of the above conditions are<br>not met.<br><br>DISCLAIMER<br>THE FONT SOFTWARE IS PROVIDED "AS IS", WITHOUT WARRANTY OF ANY KIND,<br>EXPRESS OR IMPLIED, INCLUDING BUT NOT LIMITED TO ANY WARRANTIES OF<br>MERCHANTABILITY, FITNESS FOR A PARTICULAR PURPOSE AND NONINFRINGEMENT<br>OF COPYRIGHT, PATENT, TRADEMARK, OR OTHER RIGHT. IN NO EVENT SHALL THE<br>COPYRIGHT HOLDER BE LIABLE FOR ANY CLAIM, DAMAGES OR OTHER LIABILITY,<br>INCLUDING ANY GENERAL, SPECIAL, INDIRECT, INCIDENTAL, OR CONSEQUENTIAL<br>DAMAGES, WHETHER IN AN ACTION OF CONTRACT, TORT OR OTHERWISE, ARISING<br>FROM, OUT OF THE USE OR INABILITY TO USE THE FONT SOFTWARE OR FROM<br>OTHER DEALINGS IN THE FONT SOFTWARE. Copyright (c) 2011, Natanael Gama ( http://www.ndiscovered.com | exo(at)ndiscovered.com>),<br>with Reserved Font Name Exo.<br><br>This Font Software is licensed under the SIL Open Font License, Version 1.1.<br>This license is copied below, and is also available with a FAQ at:<br>http://scripts.sil.org/OFL<br><br><br>-----------------------------------------------------------<br>SIL OPEN FONT LICENSE Version 1.1 - 26 February 2007<br>-----------------------------------------------------------<br><br>PREAMBLE<br>The goals of the Open Font License (OFL) are to stimulate worldwide<br>development of collaborative font projects, to support the font creation<br>efforts of academic and linguistic communities, and to provide a free and<br>open framework in which fonts may be shared and improved in partnership<br>with others.<br><br>The OFL allows the licensed fonts to be used, studied, modified and<br>redistributed freely as long as they are not sold by themselves. 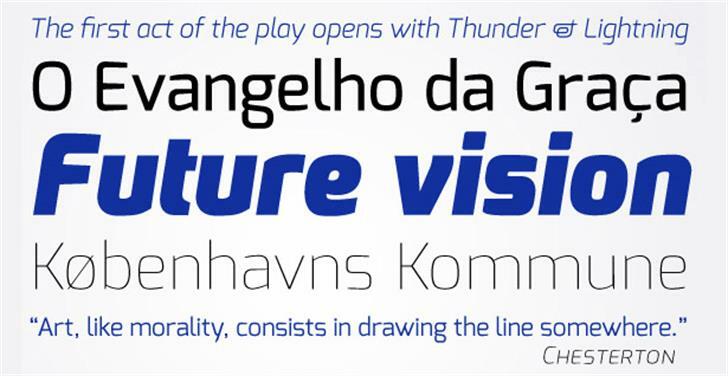 The<br>fonts, including any derivative works, can be bundled, embedded, <br>redistributed and/or sold with any software provided that any reserved<br>names are not used by derivative works. The fonts and derivatives,<br>however, cannot be released under any other type of license. The<br>requirement for fonts to remain under this license does not apply<br>to any document created using the fonts or their derivatives.<br><br>DEFINITIONS<br>"Font Software" refers to the set of files released by the Copyright<br>Holder(s) under this license and clearly marked as such. This may<br>include source files, build scripts and documentation.<br><br>"Reserved Font Name" refers to any names specified as such after the<br>copyright statement(s).<br><br>"Original Version" refers to the collection of Font Software components as<br>distributed by the Copyright Holder(s).<br><br>"Modified Version" refers to any derivative made by adding to, deleting,<br>or substituting -- in part or in whole -- any of the components of the<br>Original Version, by changing formats or by porting the Font Software to a<br>new environment.<br><br>"Author" refers to any designer, engineer, programmer, technical<br>writer or other person who contributed to the Font Software.<br><br>PERMISSION & CONDITIONS<br>Permission is hereby granted, free of charge, to any person obtaining<br>a copy of the Font Software, to use, study, copy, merge, embed, modify,<br>redistribute, and sell modified and unmodified copies of the Font<br>Software, subject to the following conditions:<br><br>1) Neither the Font Software nor any of its individual components,<br>in Original or Modified Versions, may be sold by itself.<br><br>2) Original or Modified Versions of the Font Software may be bundled,<br>redistributed and/or sold with any software, provided that each copy<br>contains the above copyright notice and this license. 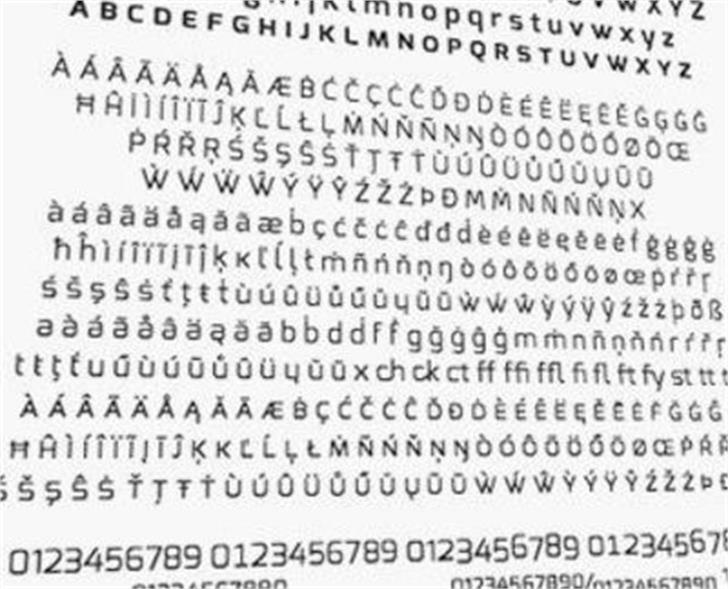 These can be<br>included either as stand-alone text files, human-readable headers or<br>in the appropriate machine-readable metadata fields within text or<br>binary files as long as those fields can be easily viewed by the user.<br><br>3) No Modified Version of the Font Software may use the Reserved Font<br>Name(s) unless explicit written permission is granted by the corresponding<br>Copyright Holder. This restriction only applies to the primary font name as<br>presented to the users.<br><br>4) The name(s) of the Copyright Holder(s) or the Author(s) of the Font<br>Software shall not be used to promote, endorse or advertise any<br>Modified Version, except to acknowledge the contribution(s) of the<br>Copyright Holder(s) and the Author(s) or with their explicit written<br>permission.<br><br>5) The Font Software, modified or unmodified, in part or in whole,<br>must be distributed entirely under this license, and must not be<br>distributed under any other license. The requirement for fonts to<br>remain under this license does not apply to any document created<br>using the Font Software.<br><br>TERMINATION<br>This license becomes null and void if any of the above conditions are<br>not met.<br><br>DISCLAIMER<br>THE FONT SOFTWARE IS PROVIDED "AS IS", WITHOUT WARRANTY OF ANY KIND,<br>EXPRESS OR IMPLIED, INCLUDING BUT NOT LIMITED TO ANY WARRANTIES OF<br>MERCHANTABILITY, FITNESS FOR A PARTICULAR PURPOSE AND NONINFRINGEMENT<br>OF COPYRIGHT, PATENT, TRADEMARK, OR OTHER RIGHT. IN NO EVENT SHALL THE<br>COPYRIGHT HOLDER BE LIABLE FOR ANY CLAIM, DAMAGES OR OTHER LIABILITY,<br>INCLUDING ANY GENERAL, SPECIAL, INDIRECT, INCIDENTAL, OR CONSEQUENTIAL<br>DAMAGES, WHETHER IN AN ACTION OF CONTRACT, TORT OR OTHERWISE, ARISING<br>FROM, OUT OF THE USE OR INABILITY TO USE THE FONT SOFTWARE OR FROM<br>OTHER DEALINGS IN THE FONT SOFTWARE. Copyright (c) 2011, Natanael Gama ( www.ndiscovered.com | exo(at)ndiscovered.com>),<br>with Reserved Font Name Exo.<br><br>This Font Software is licensed under the SIL Open Font License, Version 1.1.<br>This license is copied below, and is also available with a FAQ at:<br>http://scripts.sil.org/OFL<br><br><br>-----------------------------------------------------------<br>SIL OPEN FONT LICENSE Version 1.1 - 26 February 2007<br>-----------------------------------------------------------<br><br>PREAMBLE<br>The goals of the Open Font License (OFL) are to stimulate worldwide<br>development of collaborative font projects, to support the font creation<br>efforts of academic and linguistic communities, and to provide a free and<br>open framework in which fonts may be shared and improved in partnership<br>with others.<br><br>The OFL allows the licensed fonts to be used, studied, modified and<br>redistributed freely as long as they are not sold by themselves. The<br>fonts, including any derivative works, can be bundled, embedded, <br>redistributed and/or sold with any software provided that any reserved<br>names are not used by derivative works. The fonts and derivatives,<br>however, cannot be released under any other type of license. The<br>requirement for fonts to remain under this license does not apply<br>to any document created using the fonts or their derivatives.<br><br>DEFINITIONS<br>"Font Software" refers to the set of files released by the Copyright<br>Holder(s) under this license and clearly marked as such. This may<br>include source files, build scripts and documentation.<br><br>"Reserved Font Name" refers to any names specified as such after the<br>copyright statement(s).<br><br>"Original Version" refers to the collection of Font Software components as<br>distributed by the Copyright Holder(s).<br><br>"Modified Version" refers to any derivative made by adding to, deleting,<br>or substituting -- in part or in whole -- any of the components of the<br>Original Version, by changing formats or by porting the Font Software to a<br>new environment.<br><br>"Author" refers to any designer, engineer, programmer, technical<br>writer or other person who contributed to the Font Software.<br><br>PERMISSION & CONDITIONS<br>Permission is hereby granted, free of charge, to any person obtaining<br>a copy of the Font Software, to use, study, copy, merge, embed, modify,<br>redistribute, and sell modified and unmodified copies of the Font<br>Software, subject to the following conditions:<br><br>1) Neither the Font Software nor any of its individual components,<br>in Original or Modified Versions, may be sold by itself.<br><br>2) Original or Modified Versions of the Font Software may be bundled,<br>redistributed and/or sold with any software, provided that each copy<br>contains the above copyright notice and this license. These can be<br>included either as stand-alone text files, human-readable headers or<br>in the appropriate machine-readable metadata fields within text or<br>binary files as long as those fields can be easily viewed by the user.<br><br>3) No Modified Version of the Font Software may use the Reserved Font<br>Name(s) unless explicit written permission is granted by the corresponding<br>Copyright Holder. This restriction only applies to the primary font name as<br>presented to the users.<br><br>4) The name(s) of the Copyright Holder(s) or the Author(s) of the Font<br>Software shall not be used to promote, endorse or advertise any<br>Modified Version, except to acknowledge the contribution(s) of the<br>Copyright Holder(s) and the Author(s) or with their explicit written<br>permission.<br><br>5) The Font Software, modified or unmodified, in part or in whole,<br>must be distributed entirely under this license, and must not be<br>distributed under any other license. The requirement for fonts to<br>remain under this license does not apply to any document created<br>using the Font Software.<br><br>TERMINATION<br>This license becomes null and void if any of the above conditions are<br>not met.<br><br>DISCLAIMER<br>THE FONT SOFTWARE IS PROVIDED "AS IS", WITHOUT WARRANTY OF ANY KIND,<br>EXPRESS OR IMPLIED, INCLUDING BUT NOT LIMITED TO ANY WARRANTIES OF<br>MERCHANTABILITY, FITNESS FOR A PARTICULAR PURPOSE AND NONINFRINGEMENT<br>OF COPYRIGHT, PATENT, TRADEMARK, OR OTHER RIGHT. IN NO EVENT SHALL THE<br>COPYRIGHT HOLDER BE LIABLE FOR ANY CLAIM, DAMAGES OR OTHER LIABILITY,<br>INCLUDING ANY GENERAL, SPECIAL, INDIRECT, INCIDENTAL, OR CONSEQUENTIAL<br>DAMAGES, WHETHER IN AN ACTION OF CONTRACT, TORT OR OTHERWISE, ARISING<br>FROM, OUT OF THE USE OR INABILITY TO USE THE FONT SOFTWARE OR FROM<br>OTHER DEALINGS IN THE FONT SOFTWARE. Copyright (c) 2011, Natanael Gama ( www.ndiscovered.com | exo(at)ndiscovered.com ),<br>with Reserved Font Name Exo.<br><br>This Font Software is licensed under the SIL Open Font License, Version 1.1.<br>This license is copied below, and is also available with a FAQ at:<br>http://scripts.sil.org/OFL<br><br><br>-----------------------------------------------------------<br>SIL OPEN FONT LICENSE Version 1.1 - 26 February 2007<br>-----------------------------------------------------------<br><br>PREAMBLE<br>The goals of the Open Font License (OFL) are to stimulate worldwide<br>development of collaborative font projects, to support the font creation<br>efforts of academic and linguistic communities, and to provide a free and<br>open framework in which fonts may be shared and improved in partnership<br>with others.<br><br>The OFL allows the licensed fonts to be used, studied, modified and<br>redistributed freely as long as they are not sold by themselves. 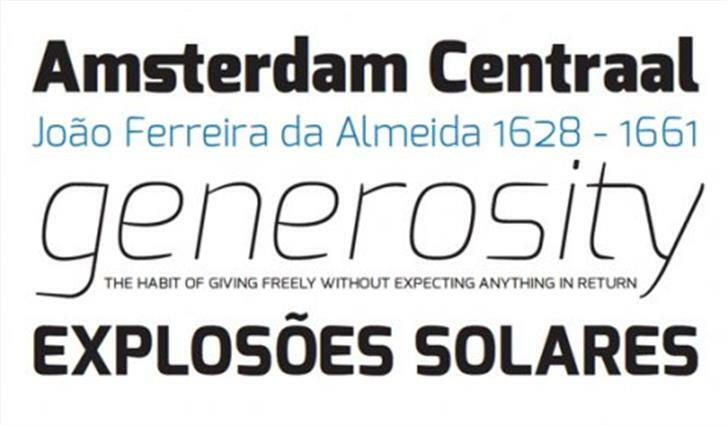 The<br>fonts, including any derivative works, can be bundled, embedded, <br>redistributed and/or sold with any software provided that any reserved<br>names are not used by derivative works. The fonts and derivatives,<br>however, cannot be released under any other type of license. The<br>requirement for fonts to remain under this license does not apply<br>to any document created using the fonts or their derivatives.<br><br>DEFINITIONS<br>"Font Software" refers to the set of files released by the Copyright<br>Holder(s) under this license and clearly marked as such. This may<br>include source files, build scripts and documentation.<br><br>"Reserved Font Name" refers to any names specified as such after the<br>copyright statement(s).<br><br>"Original Version" refers to the collection of Font Software components as<br>distributed by the Copyright Holder(s).<br><br>"Modified Version" refers to any derivative made by adding to, deleting,<br>or substituting -- in part or in whole -- any of the components of the<br>Original Version, by changing formats or by porting the Font Software to a<br>new environment.<br><br>"Author" refers to any designer, engineer, programmer, technical<br>writer or other person who contributed to the Font Software.<br><br>PERMISSION & CONDITIONS<br>Permission is hereby granted, free of charge, to any person obtaining<br>a copy of the Font Software, to use, study, copy, merge, embed, modify,<br>redistribute, and sell modified and unmodified copies of the Font<br>Software, subject to the following conditions:<br><br>1) Neither the Font Software nor any of its individual components,<br>in Original or Modified Versions, may be sold by itself.<br><br>2) Original or Modified Versions of the Font Software may be bundled,<br>redistributed and/or sold with any software, provided that each copy<br>contains the above copyright notice and this license. These can be<br>included either as stand-alone text files, human-readable headers or<br>in the appropriate machine-readable metadata fields within text or<br>binary files as long as those fields can be easily viewed by the user.<br><br>3) No Modified Version of the Font Software may use the Reserved Font<br>Name(s) unless explicit written permission is granted by the corresponding<br>Copyright Holder. This restriction only applies to the primary font name as<br>presented to the users.<br><br>4) The name(s) of the Copyright Holder(s) or the Author(s) of the Font<br>Software shall not be used to promote, endorse or advertise any<br>Modified Version, except to acknowledge the contribution(s) of the<br>Copyright Holder(s) and the Author(s) or with their explicit written<br>permission.<br><br>5) The Font Software, modified or unmodified, in part or in whole,<br>must be distributed entirely under this license, and must not be<br>distributed under any other license. The requirement for fonts to<br>remain under this license does not apply to any document created<br>using the Font Software.<br><br>TERMINATION<br>This license becomes null and void if any of the above conditions are<br>not met.<br><br>DISCLAIMER<br>THE FONT SOFTWARE IS PROVIDED "AS IS", WITHOUT WARRANTY OF ANY KIND,<br>EXPRESS OR IMPLIED, INCLUDING BUT NOT LIMITED TO ANY WARRANTIES OF<br>MERCHANTABILITY, FITNESS FOR A PARTICULAR PURPOSE AND NONINFRINGEMENT<br>OF COPYRIGHT, PATENT, TRADEMARK, OR OTHER RIGHT. IN NO EVENT SHALL THE<br>COPYRIGHT HOLDER BE LIABLE FOR ANY CLAIM, DAMAGES OR OTHER LIABILITY,<br>INCLUDING ANY GENERAL, SPECIAL, INDIRECT, INCIDENTAL, OR CONSEQUENTIAL<br>DAMAGES, WHETHER IN AN ACTION OF CONTRACT, TORT OR OTHERWISE, ARISING<br>FROM, OUT OF THE USE OR INABILITY TO USE THE FONT SOFTWARE OR FROM<br>OTHER DEALINGS IN THE FONT SOFTWARE. Copyright (c) 2011, Natanael Gama (http://www.ndiscovered.com | exo(at)ndiscovered.com),<br>with Reserved Font Name Exo.<br><br>This Font Software is licensed under the SIL Open Font License, Version 1.1.<br>This license is copied below, and is also available with a FAQ at:<br>http://scripts.sil.org/OFL<br><br><br>-----------------------------------------------------------<br>SIL OPEN FONT LICENSE Version 1.1 - 26 February 2007<br>-----------------------------------------------------------<br><br>PREAMBLE<br>The goals of the Open Font License (OFL) are to stimulate worldwide<br>development of collaborative font projects, to support the font creation<br>efforts of academic and linguistic communities, and to provide a free and<br>open framework in which fonts may be shared and improved in partnership<br>with others.<br><br>The OFL allows the licensed fonts to be used, studied, modified and<br>redistributed freely as long as they are not sold by themselves. The<br>fonts, including any derivative works, can be bundled, embedded, <br>redistributed and/or sold with any software provided that any reserved<br>names are not used by derivative works. The fonts and derivatives,<br>however, cannot be released under any other type of license. The<br>requirement for fonts to remain under this license does not apply<br>to any document created using the fonts or their derivatives.<br><br>DEFINITIONS<br>"Font Software" refers to the set of files released by the Copyright<br>Holder(s) under this license and clearly marked as such. This may<br>include source files, build scripts and documentation.<br><br>"Reserved Font Name" refers to any names specified as such after the<br>copyright statement(s).<br><br>"Original Version" refers to the collection of Font Software components as<br>distributed by the Copyright Holder(s).<br><br>"Modified Version" refers to any derivative made by adding to, deleting,<br>or substituting -- in part or in whole -- any of the components of the<br>Original Version, by changing formats or by porting the Font Software to a<br>new environment.<br><br>"Author" refers to any designer, engineer, programmer, technical<br>writer or other person who contributed to the Font Software.<br><br>PERMISSION & CONDITIONS<br>Permission is hereby granted, free of charge, to any person obtaining<br>a copy of the Font Software, to use, study, copy, merge, embed, modify,<br>redistribute, and sell modified and unmodified copies of the Font<br>Software, subject to the following conditions:<br><br>1) Neither the Font Software nor any of its individual components,<br>in Original or Modified Versions, may be sold by itself.<br><br>2) Original or Modified Versions of the Font Software may be bundled,<br>redistributed and/or sold with any software, provided that each copy<br>contains the above copyright notice and this license. These can be<br>included either as stand-alone text files, human-readable headers or<br>in the appropriate machine-readable metadata fields within text or<br>binary files as long as those fields can be easily viewed by the user.<br><br>3) No Modified Version of the Font Software may use the Reserved Font<br>Name(s) unless explicit written permission is granted by the corresponding<br>Copyright Holder. This restriction only applies to the primary font name as<br>presented to the users.<br><br>4) The name(s) of the Copyright Holder(s) or the Author(s) of the Font<br>Software shall not be used to promote, endorse or advertise any<br>Modified Version, except to acknowledge the contribution(s) of the<br>Copyright Holder(s) and the Author(s) or with their explicit written<br>permission.<br><br>5) The Font Software, modified or unmodified, in part or in whole,<br>must be distributed entirely under this license, and must not be<br>distributed under any other license. The requirement for fonts to<br>remain under this license does not apply to any document created<br>using the Font Software.<br><br>TERMINATION<br>This license becomes null and void if any of the above conditions are<br>not met.<br><br>DISCLAIMER<br>THE FONT SOFTWARE IS PROVIDED "AS IS", WITHOUT WARRANTY OF ANY KIND,<br>EXPRESS OR IMPLIED, INCLUDING BUT NOT LIMITED TO ANY WARRANTIES OF<br>MERCHANTABILITY, FITNESS FOR A PARTICULAR PURPOSE AND NONINFRINGEMENT<br>OF COPYRIGHT, PATENT, TRADEMARK, OR OTHER RIGHT. IN NO EVENT SHALL THE<br>COPYRIGHT HOLDER BE LIABLE FOR ANY CLAIM, DAMAGES OR OTHER LIABILITY,<br>INCLUDING ANY GENERAL, SPECIAL, INDIRECT, INCIDENTAL, OR CONSEQUENTIAL<br>DAMAGES, WHETHER IN AN ACTION OF CONTRACT, TORT OR OTHERWISE, ARISING<br>FROM, OUT OF THE USE OR INABILITY TO USE THE FONT SOFTWARE OR FROM<br>OTHER DEALINGS IN THE FONT SOFTWARE. Copyright (c) 2011, Natanael Gama (http://www.ndicovered.com | exo(at)ndiscovered.com),<br>with Reserved Font Name Exo.<br><br>This Font Software is licensed under the SIL Open Font License, Version 1.1.<br>This license is copied below, and is also available with a FAQ at:<br>http://scripts.sil.org/OFL<br><br><br>-----------------------------------------------------------<br>SIL OPEN FONT LICENSE Version 1.1 - 26 February 2007<br>-----------------------------------------------------------<br><br>PREAMBLE<br>The goals of the Open Font License (OFL) are to stimulate worldwide<br>development of collaborative font projects, to support the font creation<br>efforts of academic and linguistic communities, and to provide a free and<br>open framework in which fonts may be shared and improved in partnership<br>with others.<br><br>The OFL allows the licensed fonts to be used, studied, modified and<br>redistributed freely as long as they are not sold by themselves. The<br>fonts, including any derivative works, can be bundled, embedded, <br>redistributed and/or sold with any software provided that any reserved<br>names are not used by derivative works. The fonts and derivatives,<br>however, cannot be released under any other type of license. The<br>requirement for fonts to remain under this license does not apply<br>to any document created using the fonts or their derivatives.<br><br>DEFINITIONS<br>"Font Software" refers to the set of files released by the Copyright<br>Holder(s) under this license and clearly marked as such. This may<br>include source files, build scripts and documentation.<br><br>"Reserved Font Name" refers to any names specified as such after the<br>copyright statement(s).<br><br>"Original Version" refers to the collection of Font Software components as<br>distributed by the Copyright Holder(s).<br><br>"Modified Version" refers to any derivative made by adding to, deleting,<br>or substituting -- in part or in whole -- any of the components of the<br>Original Version, by changing formats or by porting the Font Software to a<br>new environment.<br><br>"Author" refers to any designer, engineer, programmer, technical<br>writer or other person who contributed to the Font Software.<br><br>PERMISSION & CONDITIONS<br>Permission is hereby granted, free of charge, to any person obtaining<br>a copy of the Font Software, to use, study, copy, merge, embed, modify,<br>redistribute, and sell modified and unmodified copies of the Font<br>Software, subject to the following conditions:<br><br>1) Neither the Font Software nor any of its individual components,<br>in Original or Modified Versions, may be sold by itself.<br><br>2) Original or Modified Versions of the Font Software may be bundled,<br>redistributed and/or sold with any software, provided that each copy<br>contains the above copyright notice and this license. These can be<br>included either as stand-alone text files, human-readable headers or<br>in the appropriate machine-readable metadata fields within text or<br>binary files as long as those fields can be easily viewed by the user.<br><br>3) No Modified Version of the Font Software may use the Reserved Font<br>Name(s) unless explicit written permission is granted by the corresponding<br>Copyright Holder. This restriction only applies to the primary font name as<br>presented to the users.<br><br>4) The name(s) of the Copyright Holder(s) or the Author(s) of the Font<br>Software shall not be used to promote, endorse or advertise any<br>Modified Version, except to acknowledge the contribution(s) of the<br>Copyright Holder(s) and the Author(s) or with their explicit written<br>permission.<br><br>5) The Font Software, modified or unmodified, in part or in whole,<br>must be distributed entirely under this license, and must not be<br>distributed under any other license. The requirement for fonts to<br>remain under this license does not apply to any document created<br>using the Font Software.<br><br>TERMINATION<br>This license becomes null and void if any of the above conditions are<br>not met.<br><br>DISCLAIMER<br>THE FONT SOFTWARE IS PROVIDED "AS IS", WITHOUT WARRANTY OF ANY KIND,<br>EXPRESS OR IMPLIED, INCLUDING BUT NOT LIMITED TO ANY WARRANTIES OF<br>MERCHANTABILITY, FITNESS FOR A PARTICULAR PURPOSE AND NONINFRINGEMENT<br>OF COPYRIGHT, PATENT, TRADEMARK, OR OTHER RIGHT. IN NO EVENT SHALL THE<br>COPYRIGHT HOLDER BE LIABLE FOR ANY CLAIM, DAMAGES OR OTHER LIABILITY,<br>INCLUDING ANY GENERAL, SPECIAL, INDIRECT, INCIDENTAL, OR CONSEQUENTIAL<br>DAMAGES, WHETHER IN AN ACTION OF CONTRACT, TORT OR OTHERWISE, ARISING<br>FROM, OUT OF THE USE OR INABILITY TO USE THE FONT SOFTWARE OR FROM<br>OTHER DEALINGS IN THE FONT SOFTWARE.